SPIDEY’S SCREWIEST SPIDER-VERSES #2: The Amazingly Beautiful Spider-Man! 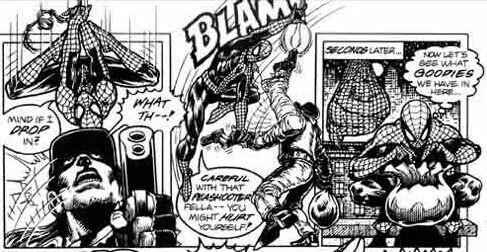 Home » COMICS HISTORY » SPIDEY’S SCREWIEST SPIDER-VERSES #2: The Amazingly Beautiful Spider-Man! Edge of Spider-Verse #5 is out this week. What better time to give you another look at the oddest and weirdest and strangest alternate Spideys? 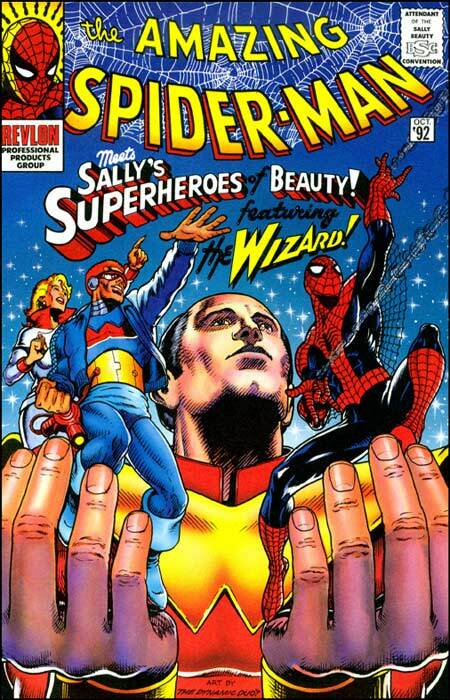 This time, John DiBello gives you Earth-Revlon Spider-Man! “You’re beautiful. You’re beautiful / You’re beautiful, it’s true,” sang James Blunt, pop singer and eventual star of a segment on VH1’s “I Love the ’00s.” Thanks to carbon-dating of a relic called a “compact disc” we can now determine that Blunt was singing about the Amazing Spider-Man, well-known to be extra-beautiful following his team-up with a cosmetic company. Yep, ol’ Peter Parker would just as soon you forgot this weird moment in his history, an adventure from another world — Earth-Revlon! — just another day in the life of SPIDER-MAN’S SCREWIEST SPIDER-VERSES! At the first glance of your impeccably, stylishly mascaraed big gorgeous eyes, THE AMAZING SPIDER-MAN MEETS SALLY’S SUPERHEROES OF BEAUTY! (FEATURING THE WIZARD!) appears to be a knockoff bootleg using our web-slinging wonder for unauthorized commercial purposes. Clues: The 1960s Ditko-style masthead and corner box looks out of place among other Spidey merch of the 1990s and the typography style of the Distinguished Competition’s flagship hero being used to advertise “Sally’s Superheroes.” This sure looks like it has lawsuit written all over it, and not, as everything else in the ’90s was, by Richard Starkings and Comicraft. In other words: Why didn’t Marvel sue the sparkly, slimming spandex pants off of Revlon, and why doesn’t Marvel Entertainment thus own Revlon Cosmetics? Well, because it was actually quite the reverse. You have to remember that weird era of a couple decades ago (in Marvel-Time, three and a half weeks) when Revlon executive Ron Perelman — no, no, not the guy who played Hellboy and Vincent the Beast — owned Marvel Entertainment Group (through his company Andrews Group, who had bought it from New World Entertainment. The same New World Entertainment which, by the way, brought us the Dolph Lundgren Punisher movie, which makes SPIDER-MAN MEETS SALLY’S SUPERHEROES look like…er…um…that run of Amazing Spider-Man in the 1990s that wasn’t too bad. The ones without the clones). The Spider-Man of Earth-Revlon doesn’t live in New York City; he’s a more down-to-earth hero who resides in Anytown, USA. I’m guessing its ZIP code is “12345.” The gentle peace that usually rests calmly over Anytown is suddenly broken by “the sound of gunshots,” although it looks to me like Dolph Lundgren is demanding that The Punisher movie get an American theater release. Enter your friendly neighborhood Spider-Man, whose quips consist of a low-level pun and humorous hyperbole in calling a deadly weapon a “peashooter.” The bad guy is soon webbed up, having forgotten the cardinal rule of crime in anytown patrolled by Spider-Man: Spidey has a justifiably low tolerance for burglars with guns. WHAT’S IN THE BAG, SPIDER-MAN? WHAT’S IN THE BAG? Despite being set in the correct era, it is not Gwyneth Paltrow’s head from the movie typographically titled “Se7en” (pronounced: SEH-seven-en, and not with the accent on the “seven”). No, it’s a veritable Victoria’s Secret Fashion Show gift bag of Revlon Realistic Professional Products, and there’s only one place that they could have been stolen from, if you ignore Macy’s, Lord & Taylor, and Saks Fifth Avenue. Oh, and drug stores like Duane Reade, Walgreens, Rite-Aid and all those mom-and-pop shops that haven’t yet been driven out of business by up-and-comer Amazon.com. And, in fact, any beauty salon. 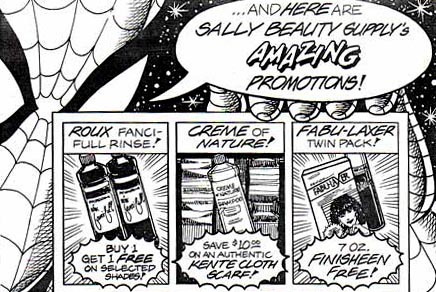 Nope, there’s only one beauty supply store these fine Revlon products could have been stolen from, and luckily Peter Parker has a leggy supermodel wife who apparently has been enthusing about it so frequently that it’s even sunk into his dense-as-a-spider’s skull. It’s Sally Beauty Supply, which, contrary to urban legend that I just made up, is not owned by Amazing Spider-Man 2 and Smokey and the Bandit 2 star Sally Field. 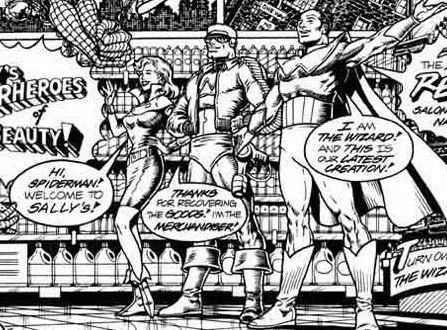 Returning the stolen products to the shop, Spidey encounters and teams up with Sally’s Superheroes of Beauty, if only by the very loose rules of Marvel Team-Up where Spider-Man and another hero appear in the same comics panel. This of course begs the question…where the heck were they when all these undoubtedly quite expensive beauty supplies were being stolen? Off fighting dull, lifeless skin in the Negative-Beauty Zone? Engaged in a life-or-death battle against the deadly beauty supervillain duo Streaking and Smearing? In the JLB Satellite, 22,300 miles above the Earth? Huh. The female hero never gets an introduction or a cool name. Maybe she’s the titular Sally, but frankly, “Titular Sally” is a terrible superhero name, and that’s coming from an era where there was a hero called “Strong Guy.” This is just typical of 1990s comics, isn’t it — strong female characters being sidelined, overlooked, or refrigerated in favor of their more prominent male counterparts. Because, let’s admit it, cosmetics and beauty products have no appeal to a female audience. Guess it’s just as well this took place on an alternate Earth, one we probably won’t see in the Spider-Verse miniseries. 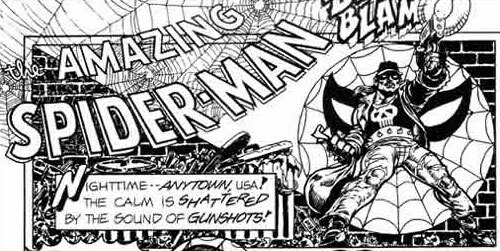 It forever must remain a lonely and half-forgotten parallel world, one of Spider-Man’s Screwiest (and Most Glamorous) Spider-Verses! “You have to remember that weird era of a couple decades ago (in Marvel-Time, three and a half weeks)” LOL! Very funny, I love articles like this. Well there you go, Arlen! Oh, Arlen! Say it ain’t so!! Thanks for this article! If anyone knows of a way to get a copy of this issue. I am completing a collection of spiderman comics and would really like to find this rare, unique issue. Thanks!